Ed Morrissey has blogged at Captain's Quarters since 2003, and has a daily radio show at BlogTalkRadio, where he serves as Political Director. Called "Captain Ed" by his readers, Ed is a father and grandfather living in the Twin Cities area of Minnesota, a native Californian who moved to the North Star State because of the weather. He lives with his wife Marcia, also known as the First Mate, and frequently watch their granddaughter Kayla, known to CapQ readers as The Little Admiral. Their son David and daughter-in-law Melissa attend college in the area and do a wonderful job raising Kayla, but Captain Ed hasn't come up with good nicknames for them yet. 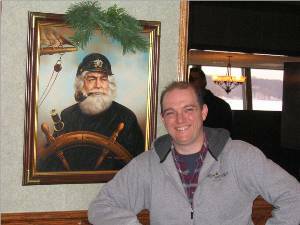 Ed started Captain's Quarters in October 2003 and was fortunate enough to "meet" many kind people in the blogosphere. Thanks to the efforts of nationally-syndicated radio host, columnist, and author Hugh Hewitt, Captain's Quarters joined the Northern Alliance, a coalition of conservative bloggers in Minnesota who are regular listeners of Hugh's radio show. With Hugh's initiative and strong recommendation, the Northern Alliance has broadcast intelligent conservative commentary to the Twin Cities on Saturday afternoons since March 2004. My original Typepad blog had an explanation of the origins of "Captain Ed", but here it is again so I don't mislead people by mistake ... It's a nickname bestowed on me by a former girlfriend during a time in my life when I was a huge Star Trek fan, and had named my first car the Carship Enterprise, and had bought a license-plate frame with that on it. For a birthday gift, she got me a set of personalized license plates that read CPTN ED to fit within it. Well, I thought that was pretty cool. In fact, I liked it so much that I transferred those plates to every new car I bought until I moved to Minnesota, when I finally decided enough was enough. The old plates, which outlasted my Star Trek passion by several years and the girlfriend by even more, are in my office at home. By that time, I had used the nickname on the Internet for years on e-mail, newsgroups, listservs, and blog comments. When I set up my own blog, it seemed natural to call it "Captain's Quarters". So keep in mind -- the Captain has more in common with Daryl Dragon, the Captain from Captain & Tenille, than he does with the brave men and women serving now or in the past in our nation's military; it's just a nickname.